In 2017-2018, an exchange project between Tokyo University of the Arts (TUA), Japan and Ho Chi Minh City University of Fine Arts (HCMCFA), Vietnam was organized. From 22nd -30th October 2017, Assistant Professor Huynh Thanh Trang and two of her students visited Japan to hold workshops and conduct fieldwork with Professor Yoshitaka Mōri, his students and guest artist James Jack in Tokyo and the Goto Islands in Nagasaki Prefecture. From 12th -18th November, Mōri, his nine students and Jack went to Ho Chi Minh, Vietnam to hold workshops and conduct fieldwork. This event is part of the outcome from this exchange project. The title ‘Triangulation’ is derived from a cartographic technique. The determination of the location of one point is enabled by forming a triangle to it from two other known points. This technique is often used to identify the position of a boat for navigation. We apply this concept to think beyond the fixed relations between two places such as Tokyo and Ho Chi Minh or Japan and Vietnam, but also the ongoing processes of making relationship between any two cities or any two nations. This leads to the exploration of long-term, complicated and flexible relationships that cannot be reduced to direct one to one between two nations, two cities and even two universities. This includes consideration not only with human relationships, but also with networks of animals like the hachikuma bird and fishes and plants: it also asks us to rethink about environmental issues in the history. 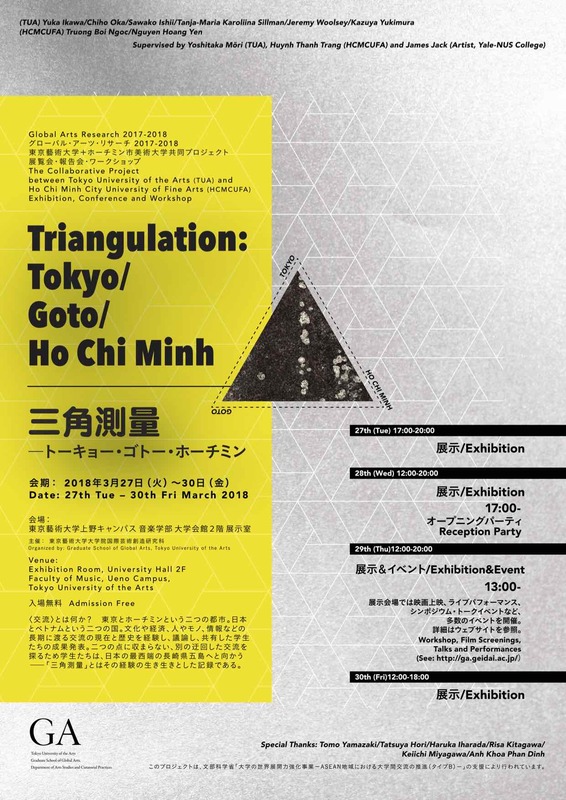 We discuss different layers of exchanges through our imagination with the theme of triangulation. During the event, outcome of fieldwork research and related artworks will be exhibited while talk events and performances will be organized. The detail will be announced soon. Please be free to join us. This project is supported by ‘Inter-University Exchange Project – Support for the formation of Collaborative Programs with Universities in Asia – Type B (promoting the inter-university exchange in ASEAN)’, Ministry of Education, Culture, Sports, Science and Technology (MEXT), Japan. The Exhibition “Pn – Powers of PLAY -” Curated by Students Will Open Soon.